At Pangeanic we are a leading provider of fast turnaround, cost-effective and high-quality translation services for Miami. Our clients include large international organizations such as FIFA, Sony, Subaru, as well as financial institutions, the EU government and US government agencies, legal firms, insurance companies, life science and health companies. We are proud to serve the needs of large companies indeed, but also individuals and smaller companies that need quality translation services in Miami. Benefit from a dedicated user dashboard to order translation services in Miami, machine translate files and have them post-edited or order human translation services. Our Client Area will show all expenditure and any type of metrics you require. Our systems are secure because we serve government and corporations handling personal and highly confidential documents. 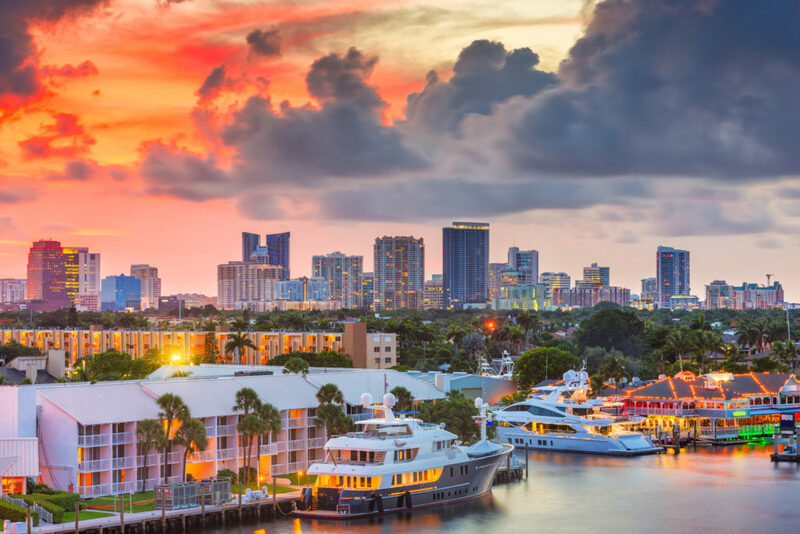 Fort Lauderdale, Florida, USA skyline and river at dusk. All Pangeanic translators and project managers work inside a closely monitored 24/7 central management system to ensure your personal and sensitive information is safe in our hands: at delivery to us and when we deliver the data to you. Trust is at the heart of what we at Pangeanic Translations do and our translation services for Miami come with 3 full ISO certifications (management, translation and medical devices). Our technology division PangeaMT can offer specialist services when you need to translate massive amounts of data, integrate machine translation in your workflow for early data assessment in international litigation, for example, run e-Discovery, anonymize data or apply specialist Natural Language Processing services. Pangeanic has developed ActivaTM, an Elastic Search-based language database where you can store your preferred terminology. We will ensure it is applied in all your translation requests, websites, flyers, technical documentation, legal forms and documents. For example: you can provide terms or phrases, brand names or products that you do not wish to translate, or that your want translated in a specific way because your in-country reviewers or branches have said what works better in their market. Each glossary is specific to each client. And terminology is extremely important when we deal with life science and biotechnology documentation. We will integrate it and make it available in our translation platform so our translators are suggested the terms during the translation process within context. After every translation job, we run specific terminology software checks to ensure terms have been applied. Our linguists check placement, grammar and structure around each term during the translation and proof reading process. Email: Send us an email to miami@pangeanic.com with your needs, contact information and attaching the files for translation. We will get back to you shortly. Call us: Call us at 617 535 7639 to speak with a language solutions specialist. Visit our Translation Office: Bring your personal documents to our Miami office in Southeast Financial Center, 200 South Biscayne Blvd, so we can review them and provide you with a quote, you will receive the quote by email. For business translations, please call us to set up an appointment. Perhaps you require fast turnarounds for your documents and not a specialist service. That’s why we have started an innovative Miami translation service that is calculated on hourly fees so you can easy link the economic cost of your translations to the time it takes to complete the work and forecast global language costs. Automation plays a large part in the approach of our Miami translation service: we are used to serve millions of words to our clients all over the world – and tens of thousands of translation jobs since 2000 validate our approach. Yes, we can charge by the hour (not by the traditional per-word method) in some cases and use translation tools that make our translators really efficient and save our clients money and time. A large amount of money that is paid in the translation process for the average translation job is actually invested in project management moving documents and content into and out of workflows – but this does not happen at Pangeanic. We have automated the process of importing and exporting content and managing translation jobs using our custom built software COR and PangeaBox. Our Miami translation service not only saves you time and money, it also allows you to easily retrieve past translations, place new orders, pay online and track progress. Coupled with state-of-the-art neural machine translation engines and a technology approach to language, we are able to offer the most reliable translation service in the market. Native Indians were Tesquetas, who in the 16th century met Spanish colonizers. In 1566 admiral Pedro Menéndez de Avilés, Florida’s first governor, claimed the area for Spain. A Spanish mission was constructed one year later in 1567. Spain and Great Britain successively controlled Florida, and Spain ceded it to the United States for $100M in 1821. Its Spanish roots are present everywhere, as it is the second-largest US city (after El Paso, Texas) with a Spanish-speaking majority, and the largest city with a Cuban-American plurality. Miami is the seat of Miami-Dade County, the most populous county in Florida. and the 8th most populous county in the United States with a population of just over 2,5M inhabitants. It is also the 42nd largest city proper in the US with a population of 400,000. Miami is the principal, central, and most populous city of the South Florida metropolitan area, the most populous metropolis in the South-eastern United States. According to the US Census Bureau, Miami’s metropolitan area has become the 6th largest urban area in the United States, with a population over 6,1 in 2009. Miami is a major centre and a leader in finance, commerce, culture, media, entertainment, the arts, and international trade. In 2010, Miami ranked 7th in the United States in terms of finance, commerce, culture, entertainment, fashion, education, and other sectors. It ranked thirty-third among global cities. Perhaps due to immigration, mostly Hispanic, Downtown Miami and South Florida are home to the largest concentration of international banks in the United States. The city is also home to many large domestic and international companies. The Civic Center is a major centre for research institutes, medical centres, hospitals and biotechnology industries. A curious fact about Miami is that its port has been the number one cruise passenger port in the world, accommodating some of the world’s largest cruise ships and operations. It is known as the “Cruise Capital of the World” and is currently the busiest in both passenger traffic and cruise lines. In 2008, Forbes magazine ranked Miami “America’s Cleanest City”, for its year-round good air quality, vast green spaces, clean drinking water, clean streets and city-wide recycling programs. According to a 2009 UBS study of 73 world cities, Miami was ranked as the richest city in the United States, and the world’s fifth-richest city in terms of purchasing power. Spanish is one the most popular request for our translation services in Miami, closely followed by French, German, Italian, Russian, Japanese, Chinese and Korean.